According to a report by The Star, RON 95 fuel subsidies will be implemented by the second half of next year and will be done in stages. Domestic trade and consumer affairs minister Datuk Seri Saifuddin Nasution Ismail said companies are able to partake in the request for proposal to prepare a system for the subsidies. As reported previously, the exercise is being handled by the finance ministry, and will involve developing, testing, implementing, studying and operating the system. “The government will choose the most competitive proposal,” said Saifuddin during Minister’s Question Time session. The minister was responding to a question from Azrina Surip, who asked whether the targeted subsidy system can be implemented before the second quarter of next year. “I am optimistic it can be implemented by the second quarter of next year. We want to implement it in stages or sort of a trial run to prepare the public to get used to the new system. We also want to ensure that the new system is seamless so that the implementation will be smooth,” Saifuddin said, adding that his ministry is gathering feedback from all players. During the tabling of Budget 2019, finance minister Lim Guan Eng said the fuel subsidy was targeted at the B40 group (salary of below RM3,000 monthly) and that a mechanism of the scheme would be worked out to prevent abuse. 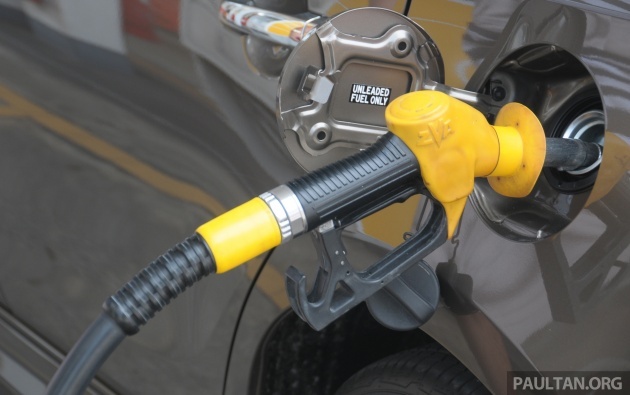 It was announced that owners of multiple/luxury cars will not benefit from the fuel subsidy. 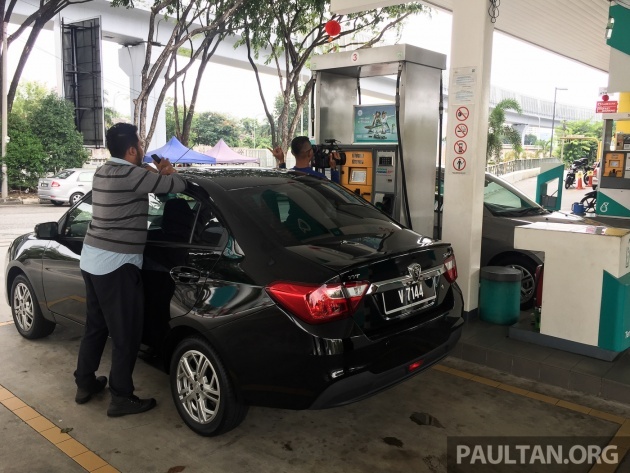 The scheme will offer a subsidy of 30 sen per litre up to 100 litres a month, for cars with an engine capacity of 1,500 cc and below. Meanwhile, motorcycles with an engine displacing 125 cc of capacity or less will be allocated the subsidy at the same rate of 30 sen per litre, for up 40 litres a month. Target small cc Car how relavent to low income??? Small cc green car should correlated to tax excise duty reduction for encouraging cheaper green car for better environment. Then subsidy should correlate to low income. Please read the article properly. It clearly stated that the government will create a mechanics where there it will be able to minimise any abuse from the public. So until such mechanism surfaces, I don’t we are in any position to complain. On the second note, we already have enough cars/motorcycle on this already crowded road in Malaysia where traffic is just literally horrible. Having said so, only a brainless people like you will keep on forcing the government to reduce car prices and get people to buy more cars. Although you can argue that our public transport sector are not perfect either, how do you expect everyone to use them as our daily driver? Well, simply adding more cars and motorcycles to the road is not the solution either. I would rather you to crack your head on how to improve the public transport sector and share your opinions in public forum. We should have chosen a Government that doesn’t seek to downsize or cancel public transportation projects. Sigh, now going to waste 5 years. Hello Mr Minister, Malaysians don’t want fuel subsidy la. We want cheaper car prices. Currently Malaysia has the highest car prices in the world thanks to the previous corrupted Government owning all the car companies in Malaysia and charging Malaysians maximum so that the previous corrupted Government can untung maximum from the rakyat. For example BMW, Ford, Hyundai all Sime Darby owned. Toyota and Perodua all UMW GLC owned. Proton DRB GLC owned. You give fuel subsidy, people only can save RM30. But you reduce car prices, people can save hundreds of ringgit from overpriced bank car loans. Which is bigger RM30 vs RM300?? Cheaper car price comes with clauses. Gasoline / Diesel peg to daily float price. Higher premiums on car insurance. Annual road Tax based on Carbon / NOx emission per power output. Excess charges on hire purchase with higher interest rate. I hope Government car help rakyat. We need help. Without help, how are we going to handle life? Ya. hope Government abolish PTPTN, 1MDB, AES, AKPK, ECRL debts.. So how does RM12 help me? Nein. Kuey Teow in Mdm Kwan is Rm15. Never was this high before, ini mesti salah PH Govt. Now a day WTI curde oil drop USD 53.35 , all Ron95 and Ron97 should revised , on 9th May election time is USD 71.14 , drop 25% (USD 53.35) , so one month review Ron97 should drop RM2.30/L or less , for Ron95 if Ron97 drop to RM2.30/L sure need to adjust Ron95 price can’t fixed RM2.20/L. If subsidised 30sen for 100L, that’s only Rm30 savings. If PH honoured their promise and give Rm1.50/L, that would be a savings of Rm70. That means each rakyat was actually subsidising the Gomen Rm40 per 100L. So what is this crap about Gomen looking after the rakyat? The rakyat is subsidising the Gomen! Tis mechanism of fuel subsidy or whatever, is really annoying and a waste of money. Need to engage a company to handle the subsidy distribution la, what else? Just make it one price, is enough what. Fuel is necessity now, even at current price also, people are feeling the the burden. No one wants to fill up petrol unnecessary unless needed. Nowdays, even luxury cars with bigger hp and torque are so fuel efficient compared to perodua or proton. They even consume less fuel compared to perodua or proton.in other word government is targeting at average rakyat rather than those rich people. Please la, scrap this idea and carry on with current price. Maybe u can review price quarterly and give subsidy to all rakyat. Please look at the car sales data. Most people are buying sub 50k price and majority are just mid and lower income earners populated this country. Meanwhile janji to set petrol at RM1.50/L is conveniently forgotten. this is fake news. It was never in PH Manifesto. Tun M also confirmed it was never in the manifesto. Who to believe? Tun M or keyboard warrior like you? We know who to trust and it’s certainly not fake name keyboard warrior like you. Stop giving excuses. When is the Government going to reduce petrol prices down to RM1.50 per liter as promised? It’s already 6 months, plenty of time to make the change. If PH cannot UBAH then we should UBAH PH!!! Government debt and corruption also fake news. No proof but keep saying corruption here and there. Also which countries don’t have debt. US also previously have 1 trillion debt. Who to believe? Evident or keyboard macai like you?. One thing which is not fake news. Prices of goods, foods, and groceries are shooting up in Pakatan era! Soon we might become like Venezuela! RON95 only Rm2.20 , not Rm2.60 previosly. Oh my. The rakyat is restless. Revolusi incoming soon? Fake news. LGE confirmed in Budget 2019 that our debt levels were at Rm700B. Who to believe? LGE of back then or LGE of today? Capati again and again. Even capati prices went upwards. Prices at hawker stalls has increased systematically over the past 10 years (even from Badawi days) – more than doubled! Frequently, each price increase came on the back of petrol price increase. They blamed their suppliers, who in turn blamed increased operating costs – increase in petrol prices, often the trigger. However, when petrol prices fall – there is never a reduction in hawker food prices (even if it fell below the previous level). When the next petrol price increase strikes – yet another round of price increase! It’s a vicious upward-only cycle! My suggestion is simple – maintain the current petrol price (Ron 95 only) come what may. If there is petrol price increase the govt need to subsidize, however when there is petrol price fall, continue to maintain the current price and treat the surplus as a reserve to offset future petrol price increases! Afterall, petrol prices are highly volatile. This may or may not include additional targeted petrol subsidy as envisaged in the 2019 Budget. Otherwise, even with the 2019 Budget targeted 30 sen per litre petrol price subsidy, the B40 communities are still hit with food price increases at the hawker stalls and supermarkets at each petrol price rise – a double whammy! Therefore, it may be prudent to review the pump prices perhaps every 10 years. This would eliminate the endless rounds of one way upward increases at hawker stalls and supermarkets. Malaysia is not a free market. It’s a crony system. Whenever there’s a price increase you can bet somewhere along the supply line there’s a political link. This is where the problem needs to be addressed. The price increase will only continue. Oil has entered bear market. And our Ron 97 is sky high. Hmmmmmmmmm. World oil prices has dropped dramatically over the last 2 weeks. Brent Crude currently at US$58.80 per barrel from a high of about US$80.00 just last month. I believe Ron 97 is adjusted on a monthly basis. Guess we’ll have to wait and see if it would be set to reflect the real world oil prices. During the last revision which went upwards, that was on the back of oil price going down. I don’t foresee it going down significantly, nor RON95 going down at all, as our petrol prices by new govt seems to defy the laws of physics & economics. Reduce it down to Rm 1.50 per liter and fix it at that level. What’s so difficult about it? If hawkers still don’t reduce food prices, then it’s gomen fault. Hope it makes a difference. It makes a difference to government coffers because like one of the calculations above shown, it wasn’t the government that is subsidising the people but the other way around, each person is subsidising Rm40 to the government. We subsidise the government so that they can use it for new national car project and unnecessary crooked bridge, not to fulfill the wishes of the rakyat but the wishes of Atuk. Memang bodoh kita buat pilihan yg salah. i think this hard how abt a guy salary less than 3k drive waja , persona cant get deduction ? i think the system need to be change , how abt a guy with 3k salary drive POLO 1.2 TSi get rebate ? not worth the hassle for mininum subsidy. better channel to br1m. then give br1m as monthly additional income for those who need. extra rm150/month for them. If they continued BR1M, it would mean they had to eat humble pie and admit that Najib’s policies were spot on. Never in a million years they would do that, so they came up with some stupid half-baked plans. You fill up RM100 worth of petrol, 80% of it goes to waste due to engine inefficiency. Rather than giving RM100 petrol subsidy for the poors, why not give them public transport RM100 subsidi card?